Romantic Vintage Diamond Bow Brooch [SH10010] - £1,250.00 : loveVintageDiamonds.com, Your Vintage Diamond Dreams Come True! 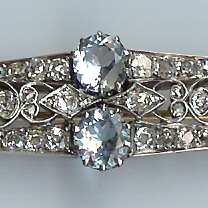 This diamond bow brooch is really rather dreamy! There are twenty-one diamonds in the brooch in total which are set into a long bow shape also has pretty cut-outs and mille-grain edging. This is an old, unusual piece which would make any item of clothing that it's worn on look amazing. It is just over 2'/2" in length, is white throughout and unmarked, and weighs approximately 5.6gms.